Laminitis has been a bane of horseman and farriers since the horse was first domesticated. As our medical knowledge and diagnostic abilities have evolved, so has our understanding of the contributing factors of this disease process, including Equine Metabolic Syndrome. 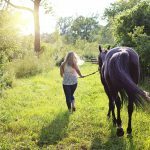 Equine Metabolic Syndrome is a term that’s been thrown around the equine community for the past few decades, but what does it mean? 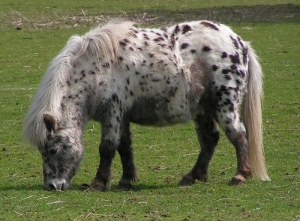 Equine metabolic syndrome (EMS) is a condition most commonly characterized by an inability to properly metabolize carbohydrates. The disease has been known by many names, including hypothyroidism, peripheral Cushing disease and pre-laminitic syndrome. Today, we know that Equine Metabolic Syndrome is characterized in horses, ponies and donkeys by obesity, regional deposition of fat, and systemic insulin resistance. Insulin is an important hormone that allows the cells to obtain glucose from food. Without insulin, or a proper response to insulin, cells cannot utilize glucose, regardless of how much food the horse is fed. This starvation process at the cellular level pushes the horse into a stressed state (characterized by elevated cortisol levels) where the body is encouraged to hold on to as much fat as possible, making weight loss next to impossible in these horses. 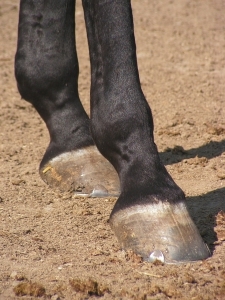 In addition, glucose deprivation in the laminae of the horse’s feet can lead to laminitis. When we suspect a horse may have EMS, we will recommend bloodwork to confirm our suspicions as well as guide us in the proper treatment of your horse. 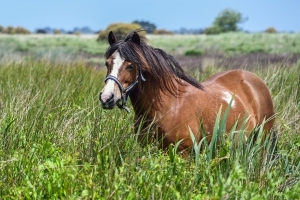 Horses with EMS may also have concurrent Cushing disease, which has been shown to be a contributing factor to the initial development of EMS. It is important for us to understand the underlying metabolic factors that are contributing to your horse’s case in order to provide the most efficacious recommendations both medically and diet. 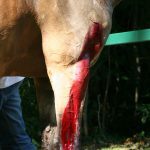 ACTH: When elevated, this value can be indicative of Equine Cushing’s Disease. Insulin: Elevated levels of insulin indicate insulin resistance. Leptin: This is a secondary value, used to ascertain the validity of elevated Insulin. When leptin is elevated in addition to elevated insulin, EMS and IR (insulin resistance) are valid diagnoses. Glucose: When both ACTH and insulin are elevated, glucose can help differentiate the primary disease process. Horses that are merely overweight but not actively laminitic should be put on a low starch diet, comprised of hay with less than 12% non-structural carbohydrates fed at 1-1.5% body weight. (in this example, a 1000lb horse should be fed 10-15lbs of hay per day). Their forage diet can be adequately balanced using either a ration balancer or a specifically formulated low starch feed. These horses also benefit from routine exercise as an additional aid for weight loss. In those patients that are actively laminitic, exercise is not recommended but the same dietary recommendations apply. In addition, if your horse is diagnosed as insulin resistant (IR), metformin is a beneficial medication used to increase tissue sensitivity to insulin. Horses with IR are comparable to humans with type 2 diabetes, in that they produce adequate amounts of insulin, but their body simply fails to respond appropriately. Metformin is a medication commonly used in humans with IR and its efficacy in equine IR cases has been confirmed both in laboratory and field studies. Another option to stimulate weight loss in EMS horses is levothyroxine, commonly sold in the equine community as Thyro-L. Thyro-L functions by increasing the rate of the horse’s metabolism to further stimulate weight loss. It is important to understand that Thyro-L has no direct impact on the laminae of an actively laminitic horse and instead works indirectly over a longer period of time. EMS is a frustrating disease for practitioners, clients and patients alike. The more we understand of the disease process the better our chances at restoring metabolic equilibrium and preventing further deterioration of the laminae. If you suspect your horse may have EMS, talk to your vet about appropriate diagnostic measures.